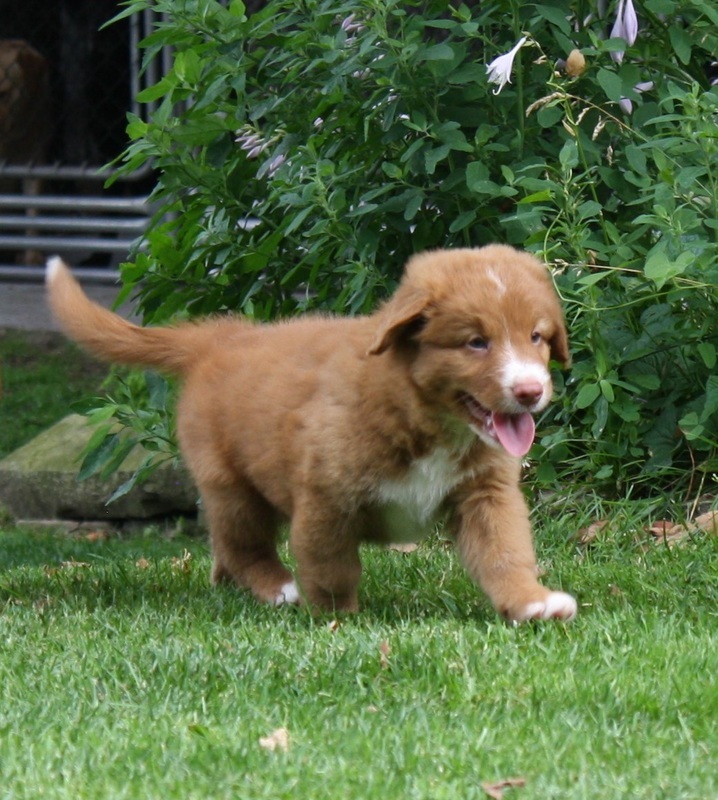 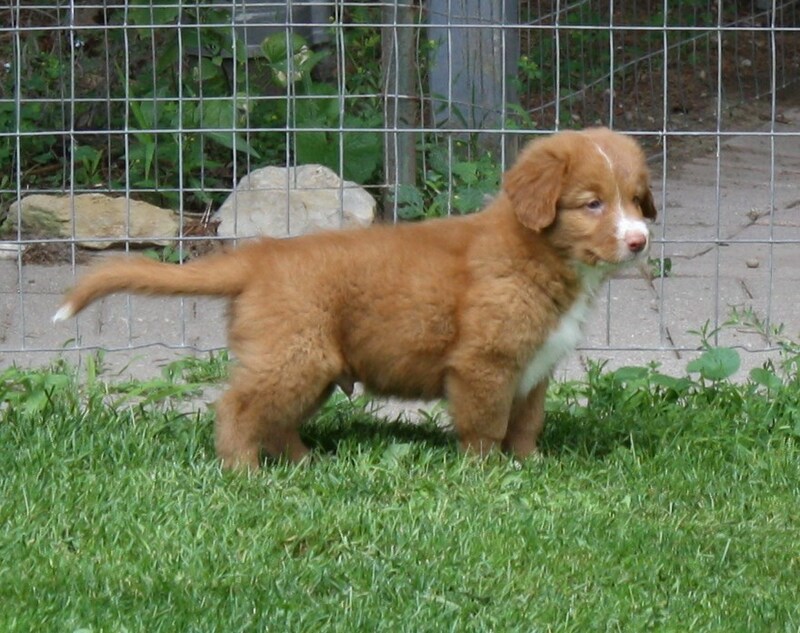 "BPISS BPIG Can CH ROANEDEN'S GOLD RUSH"
Parker has joined our friend Els from Tollers of Great Pleasure in Belgium, where he will be shown and be part of her Breeding Program..
​Parker was our keeper boy from our outstanding "Ducks Character litter". One look at his pedigree and this boy can't help but have the potential to do big things . 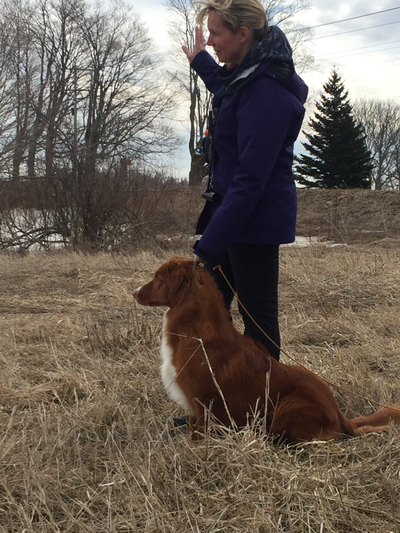 Parker's mom is our beautiful and talented girl "Tink". Tink has had huge success in the showring both in Canada and the Us. She is a fabulous working dog and is super eager to please. 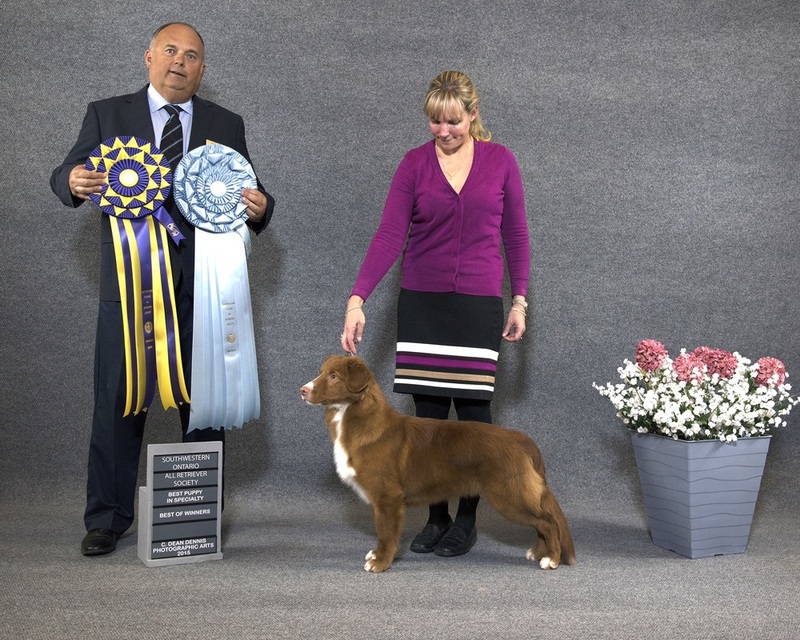 Parker's dad Mini Cooper has won Best of Breed at Westminster Kennel Club a record 4 times and has been one of the Top Tollers in the US every year shown. It was our plan for this combination to double up on all the exceptional traits of both parents and bring some additional bone and intensify that dark deep red colour that we love so much. 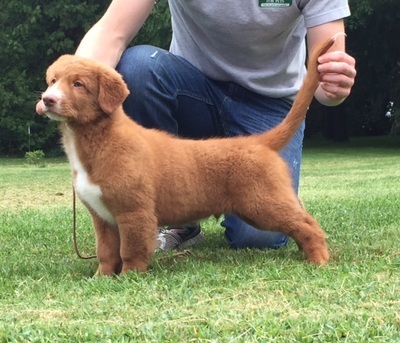 Parker is an exceptional puppy with strong bone and excellent angles front and rear. He has a flawless outgoing and friendly temperament. 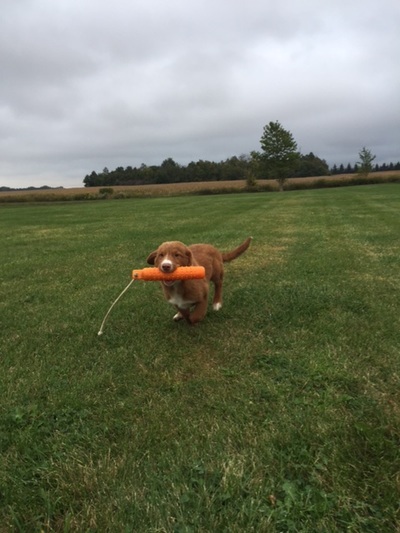 He loves to retrieve, is very trainable and motivated to please. 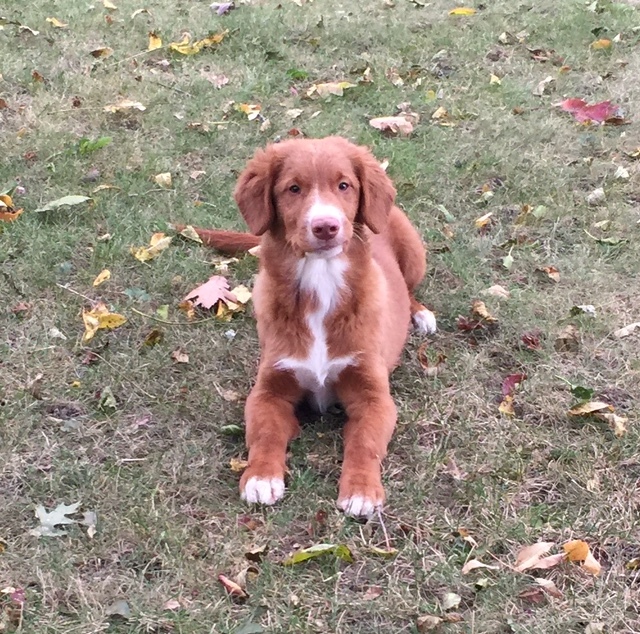 He has quickly learned a number of tricks at the age of 16 weeks. 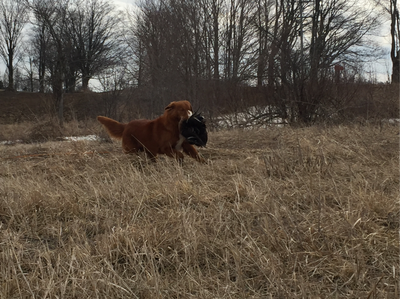 Parker is very birdy and is showing plenty of desire to hunt. 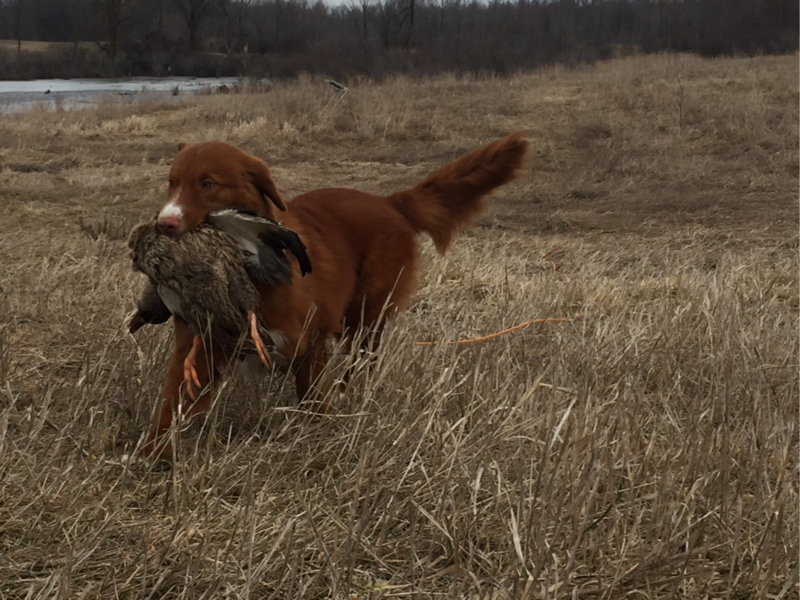 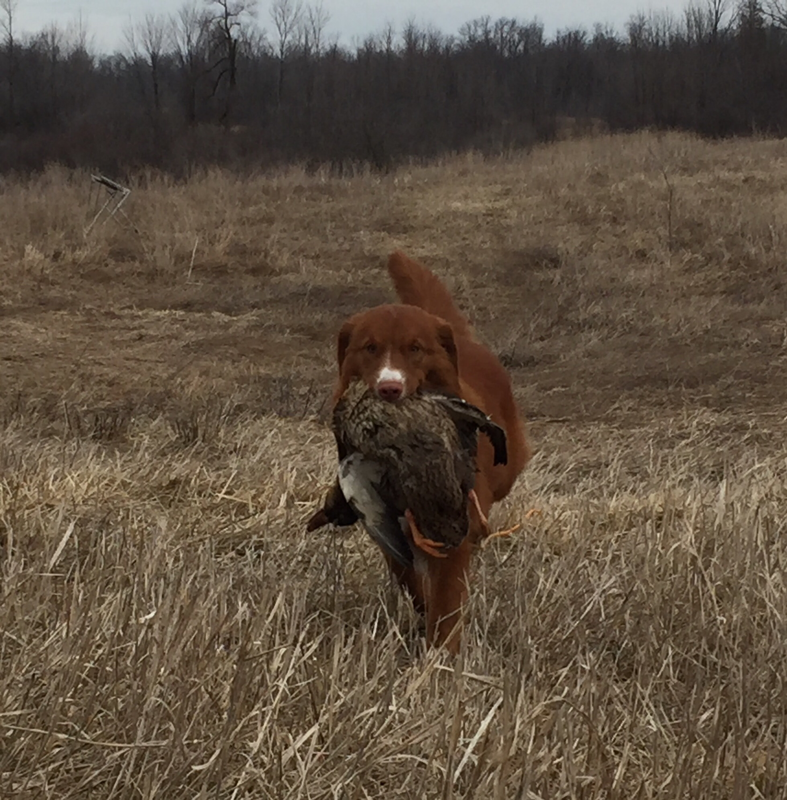 He has enjoyed multiple Pheasant hunts this fall, keeping up with the adult dogs and doing his part to flush up birds. 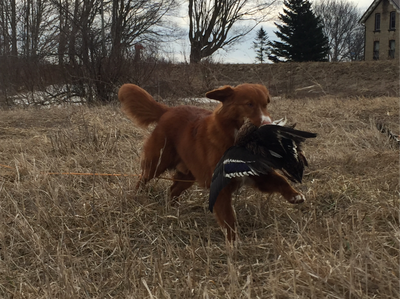 Parker makes his show debut and knocks out the competition. 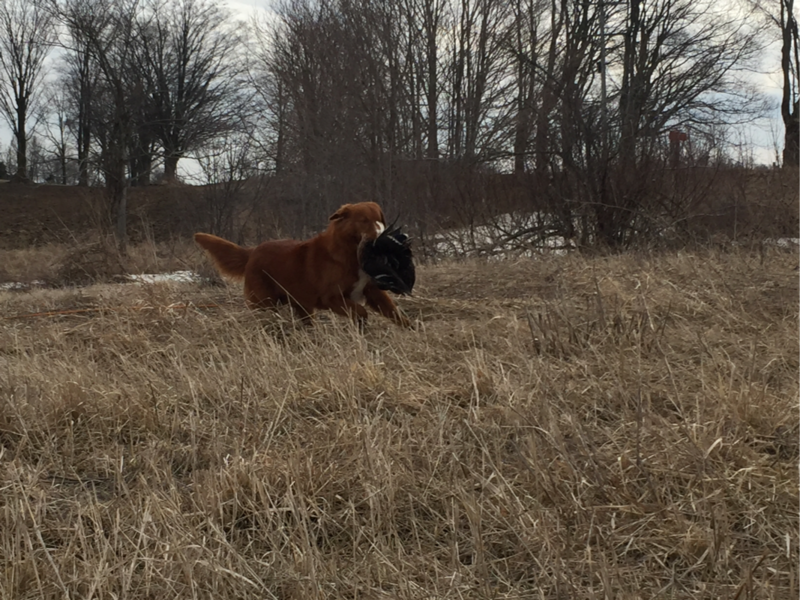 In his first two shows with competition, he picks up 6 points, defeating all class entries and picking up a Best of Breed over Specials from the Jr Puppy class at 6 months of age. 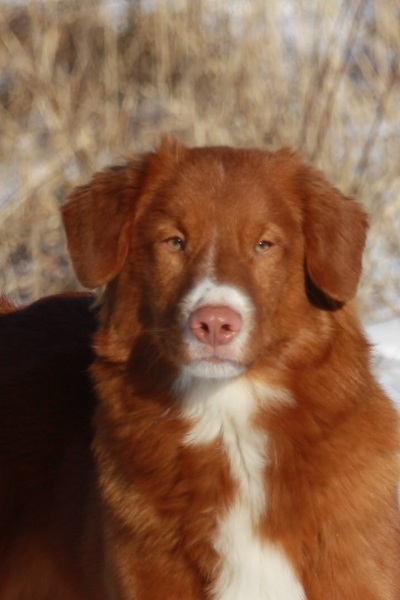 Parker finishes his Canadian Championship at 8 months of age, with multiple Best of Breed Awards, with Specials defeated! 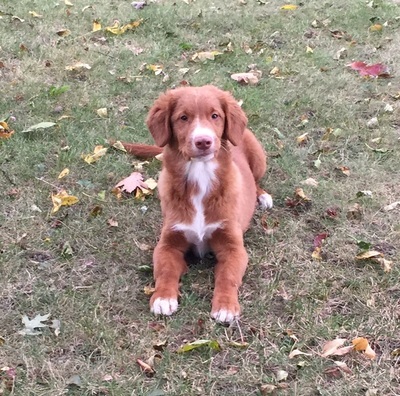 Parker is currently the star of our Puppy Classes and is actively being trained in Obedience / Rally and Field. 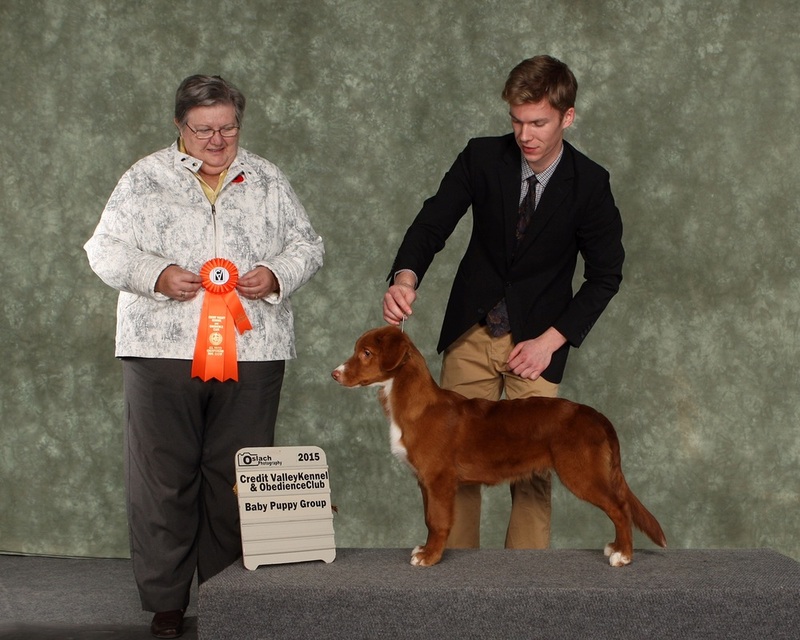 *Feb 27- Ontario Breeders Group 1 Specialty/Ontario Breeders Assoc All Breed Show, Parker wins Best of Breed for 2 pts (x2) to finish his Canadian Championship! Parker also makes the cut in a competitive 100 dog Sporting Group! 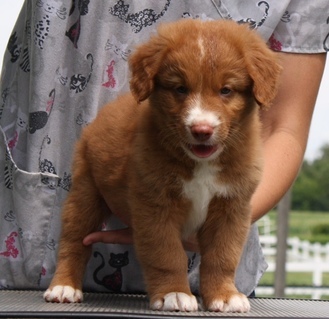 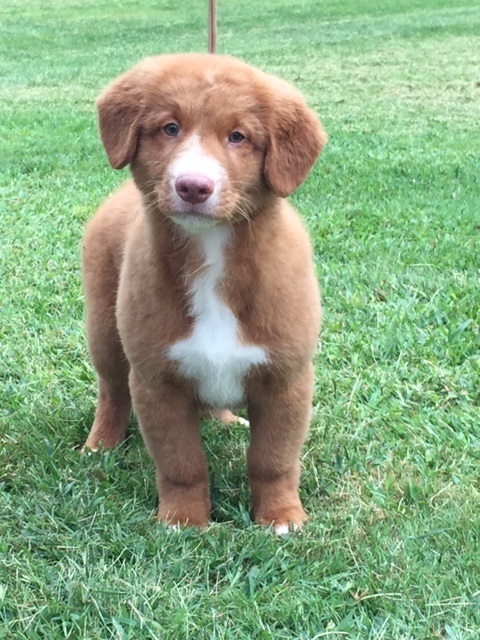 *Parker makes his show debut Dec 8 '15 at the Ontario Toller Club Booster in Orangeville. He goes on to win Best Baby Puppy in Breed and Best Baby Puppy in Group!!! 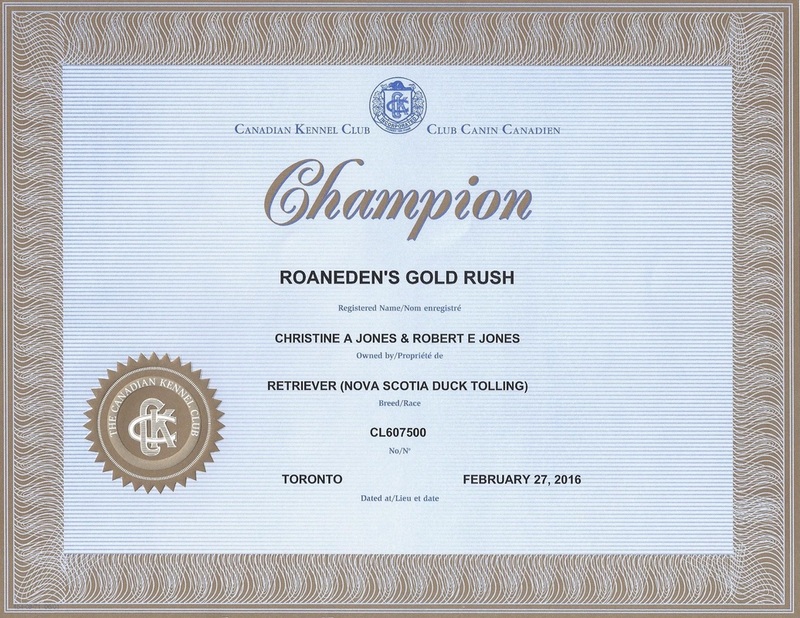 *Dec 27/15 - SOARS All Retriever Specialty - BOW for 3 pt major and Best Puppy in Specialty Show!